With just less than two weeks to go until Apple’s Worldwide Developer Conference in San Francisco, it seems that people are expecting Apple to announce more than just some information pertaining to iOS 6. It isn’t unordinary for this time of year to bring an influx of leaked parts and components that are speculated to be part of the purported next-generation iPhone. It is pretty much accepted that WWDC will bring some kind of iOS 6 announcement, paying particular attention to Apple’s expected 3D maps application, but could we also see some hardware related announcements? A few recent reports have shown a number of leaked parts, believed to be from the much anticipated iPhone 5, which seems to confirm opinions and rumors that the sixth-generation iPhone will be longer than its predecessors, while pretty much maintaining the familiar form factor of the iPhone 4S. 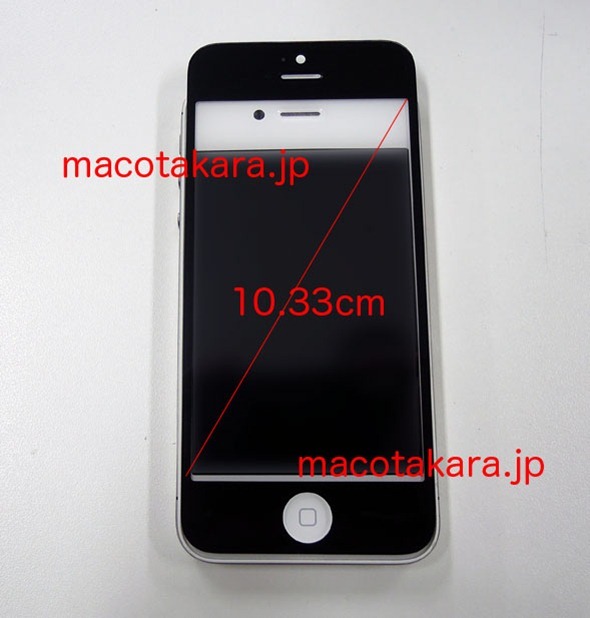 This latest revelation, coming courtesy of the guys over at Japanese blog Macotakara, show what could possibly be a front glass panel of the iPhone 5.
without knowing where the speculated components come from, it is almost impossible to determine whether or not it is genuine, but it certainly seems to match the dimensions that have been reported over the last few weeks by various sources. The panel itself is pretty much identical when it comes to its horizontal dimensions, but measures in at approximately 10.33 centimeters, which would seem to match the approximate 4-inch diagonal measurement in the device’s schematic. Macotakara are also reporting that the Home button on the possible front screen component is also slightly smaller than the one found on the current iPhone model, the 4S, as well as being ever so slightly thinner, although I fail to see how that can be measured considering it is being compared against the front display of a fully assembled 4S device. Regardless of whether or not this is an official iPhone 5 part, or one of the many ‘leaked’ parts that turn out doing nothing with the future device, it definitely seems nailed-on that we are going to see a larger display on the next-generation iPhone. With the iPhone 4S being released in October 2012, it would seem unlikely to me that Apple will make any official announcement about the iPhone 5 during WWDC, instead choosing to focus on software related announcements relating to iOS, but as always, time will reveal all.